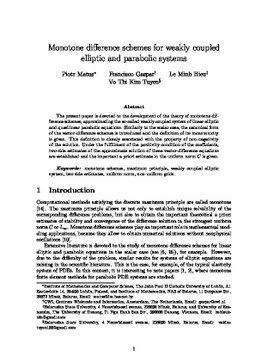 The present paper is devoted to the development of the theory of monotone difference schemes, approximating the so-called weakly coupled system of linear elliptic and quasilinear parabolic equations. Similarly to the scalar case, the canonical form of the vector-difference schemes is introduced and the definition of its monotonicity is given. This definition is closely associated with the property of non-negativity of the solution. Under the fulfillment of the positivity condition of the coefficients, two-side estimates of the approximate solution of these vector-difference equations are established and the important a priori estimate in the uniform norm C is given.